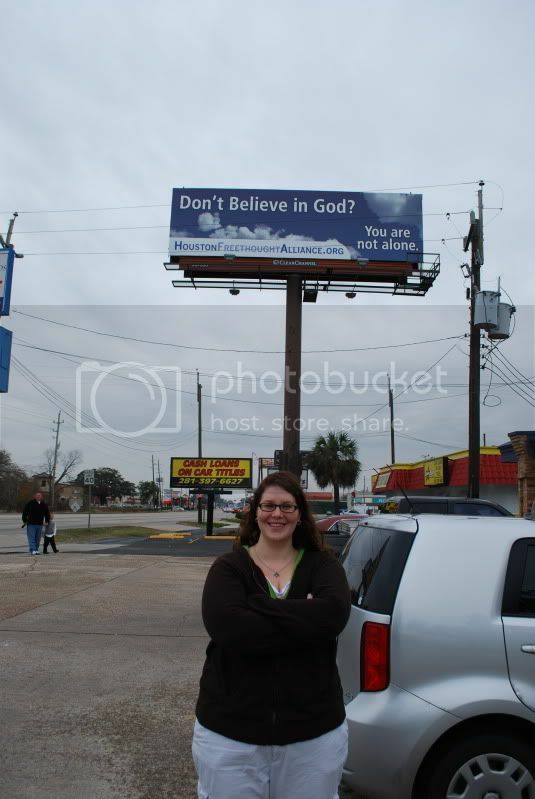 I follow Think Atheist on twitter and last night I saw the tweet about the Atheist billboard in Houston....well I had to go find it since I live in the surrounding area. It was a wee bit of a scavenger hunt but my husband and I finally located it above a liquor store on FM1960. Atheism is getting respectable at last. Cool! I love your happy smile! When I clicked on the link it said the article had been moved. I'll confess that I LOVE the idea of advocating / marketing atheism. However, I was a little 'taken-aback' by the choice of words selected for this particular bill board. To me, there is a double-entendre that is not terribly helpful. 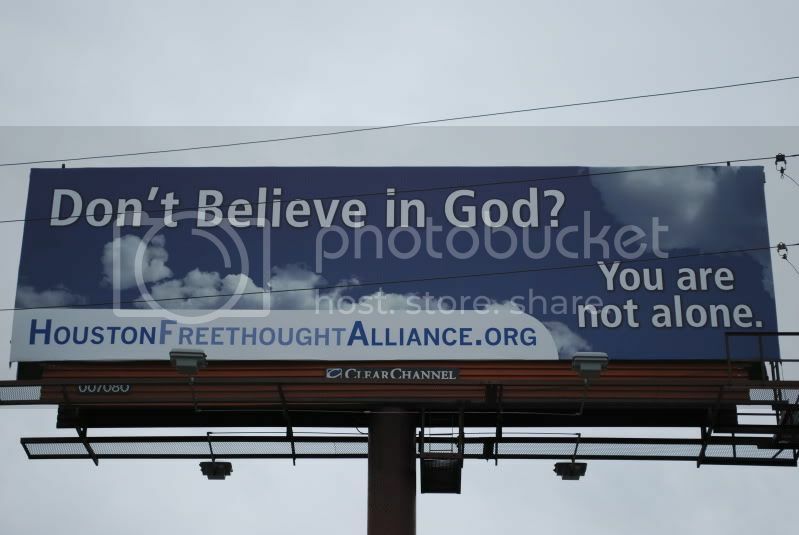 So, for example, the first and most obvious message taken from the sign is that: "There are other atheists in the community." However, were I a theist (Christian) convinced of supernatural over-seers, I could also reasonably interpret the message to mean: "Even if YOU think there is no God, you are not alone because HE is with you and is watching over you. So watch-out!" It's that second possible-but-improbable interpretation that disappoints me some. I am personally more satisfied by the bus-board ad displayed in England that says something to the effect that "There most-probably is no god." While it demonstrates modesty and commitment to evidence-based thinking, it is quite clear in its message. What do you all think? Nope...relax. "You're not alone in not believing in god".....that's the message I saw. As I recall, the 'probably' was required by the British Advertising Commission, as positive statements require evidence to back them up. Now, in everyday conversation, when it is perceived that there is ample opportunity for evidence to exist (but it still doesn't), we will just short-hand the whole concept by simply asserting that it doesn't exist at all. Please acknowledge that the effort being made on the London buses is an attempt to stay faithful to the strict confines of science in the formation of conclusions. Here's how I see it, Tricia. Since science cannot "prove" a negative, it only makes sense to say "probably," since nobody can prove otherwise.